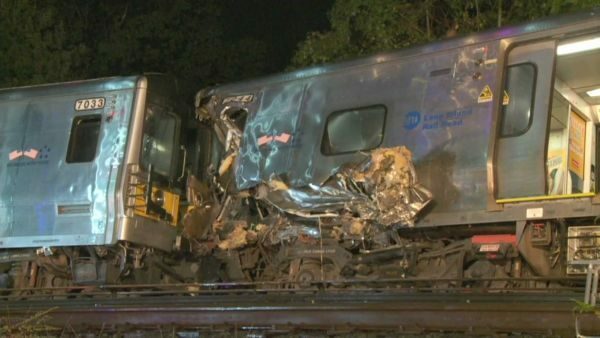 Home Tags Posts tagged with "new york train collision"
Dozens of people have been injured after a Long Island Rail Road train has derailed near New York, officials say. The incident occurred at New Hyde Park in Nassau County. The injuries are not said to be life-threatening. The 12-carriage train carrying some 600 passengers derailed at about 21:00 local time on October 8. Reports say the passenger train hit a work train about 20 miles east of New York’s Manhattan borough. Twenty-nine people were taken to hospital with injuries such as broken bones and concussion, officials said, with scores more treated at the scene for more minor injuries. Passengers told local media they saw sparks at the windows after the train began shaking before striking something and coming to a halt. The Long Island Rail Road – one of the busiest in the New York area – was closed after the crash.